CHICAGO – What is truly astounding about “Transformers: Dark of the Moon” is how overwhelming it is to take in – there is so much going on that sensory overload is a distinct possibility. Shia LaBeouf stars in the latest Transformers film, now on Blu-Ray and DVD. What is also interesting to ponder is that this whole series is based on a children’s toy, and it has gone so far beyond the war between the Autobots and the Decepticons. It reminded me of the disaster films of the 1970s, where huge casts of familiar and rising stars gathered to participate in whatever destruction was imminent. This time it’s the end of the known world and the enslavement of the population, so it’s time to get busy. The film opens in 1961, when at that time American intelligence detects a crash landing on the dark side of the moon’s surface. President John F. Kennedy is informed that it is an alien presence, and his famous “landing a man on the moon” speech is a cover for accelerating the Apollo program towards a close encounter. Indeed, Tranquility Base is where the alien craft has landed, and Apollo 11 lands there to follow up and explore. It turns out to be the “Ark,” a key element in the Transformers war between the Autobots and the Decepticons. Back in the present, our hero Sam Witwicky (Shia LaBeouf) is having trouble finding a job, even after getting a Medal of Honor. He wants to impress his new girlfriend Carly (Rosie Huntington-Whiteley), so he finds work with Accureta Systems, run by eccentric Bruce Brazos (John Malkovich). Co-worker Jerry Wang (Ken Jeong) gets Sam involved with his conspiracy theories, which involve “pillars” which have the power to bring the home world of Cybertron directly to earth. Wang is killed, but his theories turn out to be true, which brings the Autobot/Decepticon war back to Russia, Sam and eventually Chicago, Illinois. All the familiar Transformers are back, Optimus Prime, Bumblebee, Wheelie and Brains for the Autobots’ side, and Shockwave, Soundwave, Barricade and Megatron for the Decepticons. 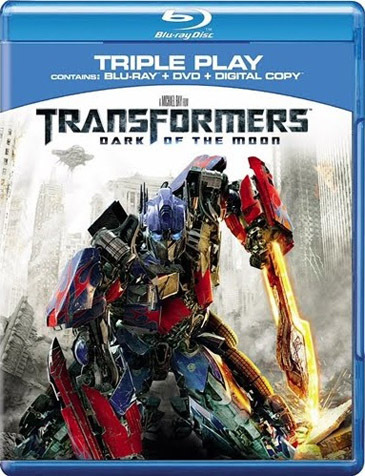 They are joined by a new Autobot, Sentinel Prime (voice of Leonard Nimoy), who is the key to the moon landing. The effects of these robots are stunning and seamless, but their presence and design are part of the sensory overload. It’s all too much, especially during the battles. But in all fairness, to the 15 year old teenage boy target market, it’s just right. The human cast mostly has fun, even when the deadly seriousness of the war on earth takes hold. New cast editions Frances McDormand, Ken Jeong and John Malkovich relish the overacting possibilities of the series, joining John Turturro in that school. Patrick Dempsey plays a bad guy, and I could tell he loved it. Shia LaBeouf is the anchor and understands his role as such, as long as he keeps getting nice arm candy, this time played by Rosie Huntington-Whiteley. It’s the incentives that can keep an actor coming back for more. Although the plot is much more lucid in this installment of the series, it still occupies way too much screen time. The action keeps coming, but threading through the breathless explanations that have to take place regarding it. The human beings in the film are almost reduced to narrators, tipping off what will happen before they do it, so it doesn’t become incomprehensible. The plot and action marriage is awkward, and adds about 20 minutes to an already long epic. But it is the action that spins the cash registers, and director Michael Bay knows how to deliver it. There are not much in the way of extras in the Blu-Ray package, just another DVD and Digital Copy for other players. Look next for a special edition, probably packaging all three films with those extras. Also the film was intended originally for 3D viewing, so some of the action is very close-up for that medium. The Transformers series will go down in film history as one of the most bombastic, gigantic and spastic film trilogies in history. Go big or stay at home, is the Michael Bay philosophy, and now you can stay at home, watching it all unfold.